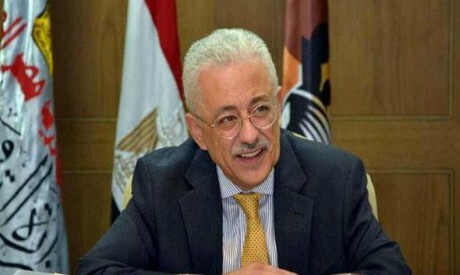 Minister of Education Tarek Shawki has issued decrees amending the examination schedule for all students to avoid Coptic feasts, reducing future exam times for grade 10 students from two to three hours to 40 to100 minutes, and temporarily suspending the use of tablets in exams. Shawki said that the 600,000 students in grade 10 in 2,500 schools nationwide still need time to be trained in using the tablets and so will sit first term exams using the old method. Tablet-based exams will be introduced in the second term. Shawki also cancelled monthly exams for grade 10 students until they have all received tablets. “We must prevent teachers from exploiting students by pressuring them to take private lessons,” said Shawki. He added that when students receive their tablets all exams will be graded by computer and teachers will not be able to interfere. The new education system comes into force this year for kindergarten, grade one and grade 10 students, and will be gradually rolled out until it covers all schools. “Next academic year the new system will be applied in grade 11. The system will be applied to preparatory stage pupils only after it has been rolled out to cover all secondary stage students,” said Ministry of Education Spokesman Ahmed Saber. The Education Ministry plans to distribute 708,000 tablets among grade 10 — or first secondary — students. The ministry has already received 55 per cent of the tablets. “As soon as the rest arrive they will be distributed among students and teachers. The ministry expects all tablets to be allocated by the end of December,” said Saber. The shorter exams, reduced from up to three hours to between 40 to 100 minutes, will not apply to current end-of-term papers, says Reda Hegazi, head of the General Education Sector at the Ministry of Education. “This year the duration will be as usual since students are yet to be trained in using the tablets and need to be familiarised with the new type of exam questions,” said Hegazi. The exam schedule has been also amended so as not to include more than one subject a day. “There will be a reasonable space between exams so as to avoid Coptic feasts and to provide students with time for revision,” said Hegazi. The new education system is based on digital learning and eliminates testing based on memory. Students will be trained to use their tablets to log onto educational websites, among them the Bank of Knowledge, York Press and Encyclopaedia Britannica. Tests will be sent to students’ tablets, and will be answered and marked electronically. Students will be required to complete 12 exams in each subject during their three secondary school years. The highest six grades will be used to calculate a student’s final grade. In April Egypt received a $500 million loan from the World Bank earmarked for teacher training and upgrading the educational system.